Vézelay was one of the first British artists to explore abstraction. Born Marjorie Watson-Williams, she changed her name after moving to Paris in the 1920s, perhaps to identify more closely with France. In Curves and Circles she brings together a series of abstract shapes, with elegant, twisting curves that seem to trace the movement of the artist’s hand. The background resembles a cloudy sky, as if the lines were floating in air. Lit: Ronald Alley, ‘Introduction' in Paule Vézelay, exh. cat., Tate Gallery, 1983, p.10, (repr. p.32); Sarah Wilson, ‘Paule Vézelay at the Tate', Artscribe, no.40, April 1983, p.51, repr. 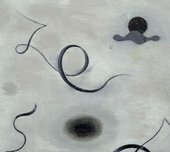 Paule Vézelay made her first abstract paintings in 1928, two years after she had settled in Paris. She later commented that her painting had become abstract as she ‘began to lose interest in people and things for their own sake and to become interested in colours and forms for their own sake' (June Rose, ‘Mme Vézelay - avant garde in Barnes', Times, 16 Oct. 1968, p.9). In the period of transition from figurative to non-figurative work which lasted till c.1933 she produced works which had stylised but still recognisable motifs alongside her more rigorously abstract paintings. Often her imagery suggested some aspect of the natural world in the allusive contours of the predominantly curvilinear forms she employed. In T03954 Vézelay has moved away from the evident allusiveness of the biomorphic forms and curving lines exploited in her other works of the early 1930s. However, although the rounded forms and calligraphic markings in T03954 escape precise identification, they give the impression of floating in an atmospheric space which can be seen as related to the cloudy sky in ‘Flags', 1929 (repr. Tate Gallery exh. cat. 1983, p.31). Sarah Wilson writes that in ‘Curves and Circles' Vézelay has created ‘a completely abstract work, but the atmosphere, and even a sense of "personnage" in these animated lines is still present' (Wilson 1983, p.51). From 1929-33 Vézelay lived with the French Surrealist artist André Masson and in these years produced many paintings which in their calligraphic lines appear close to the work of Masson. This and the vestigal references to the natural world found in her paintings perhaps account for the fact that Vézelay's works were seen by some at the time to lie on the fringes of the Surrealist movement. In the year T03954 was painted, some of Vézelay's works were included in a Surrealist group show De Onafhankelijen in the Stedelijk Museum, Amsterdam, and the Surrealist poet Robert Desnos wrote a preface for an exhibition of her work at the Galerie Vavin Raspail in Paris.